The Westpac Porirua Business Excellence Awards took place on Friday 20 November at Pataka in Porirua. 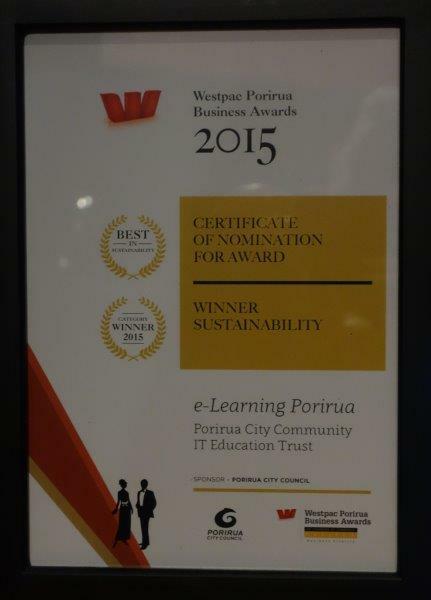 e-Learning Porirua won the “Best in Sustainability Sector Award”. Members of Plimmerton Rotary have been involved with the work of the Board since the very beginning. Michael Stevens, one time member, was the Executive Director for some years and Wendy Betteridge has been on the Board since its inception. She has been responsible for comunication, its web site and media for the past two years. You can read a full report of the meeting on the e-Learning site here. Original generation time 1.2873 seconds.